Laminating Pouch Measures: 2.25" x 3.75" (57mm x 95mm). Laminating Film Available Thicknesses: 5 Mil, 7 Mil or 10 Mil. Laminating Film Available Finishes: Clear Gloss, Color, Matte and Sticky Back Thermal Laminating Sheets for use in hot pouch laminator machine. 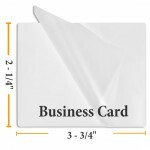 Looking for cheap laminating pouches? 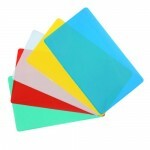 Check out our bulk discounts on cases of laminating pouches.